(Newser) – A powerful earthquake with a preliminary magnitude of 6.8 struck in the Arctic Ocean Friday, northwest of a largely uninhabited and remote Norwegian island, officials said. No injuries or damage were immediately reported. 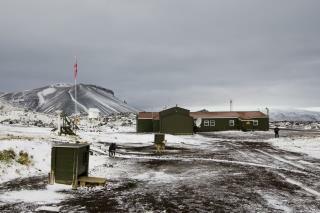 The Norwegian earthquake center NORSAR says the quake was recorded at 2:49am in the sea between the volcanic island of Jan Mayen and Greenland, a Danish territory, the AP reports. The tremor was centered some 74 miles off Jan Mayen at a depth of approximately 6.2 miles, NORSAR said. Norway's news agency NTB said there were 18 people on the island—military and meteorological institute staff—who were woken by the quake. Conservatives: "More proof that climate change is a hoax!" MAGA caps nod in silent obedience. 6.8 is nothing to sneeze at. I was in a 6.9 in 1971 in So Cal. Was scary.